Despite late drama, Delhi Dynamos proved that no team is unbeatable in the Hero Indian Super League (ISL) as they coasted to a 2-1 victory in a third round clash in FC Pune City on Wednesday. FC Pune City had gone into this game on the back of two consecutive victories at the start and looked to consolidate their position at the top of the table. 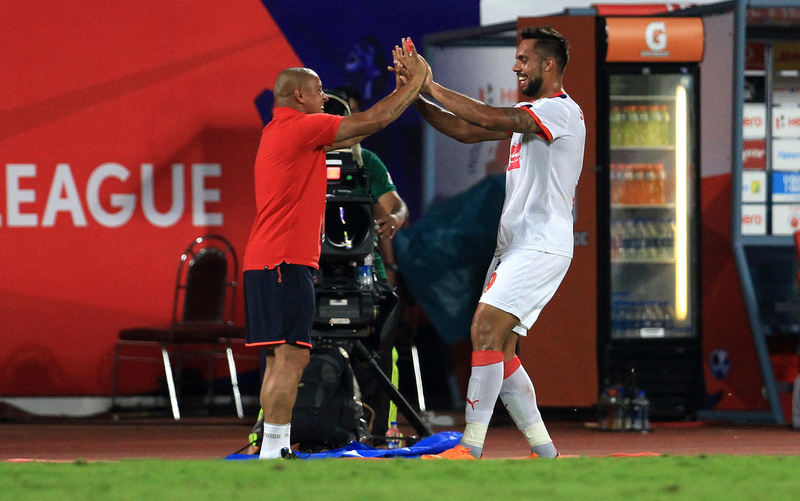 However, the visitors, coached by Brazilian great Roberto Carlos, stuck to their game-plan and scored the goals through Robin Singh (23rd minute) and Richard Gadze (90+6th) while Kalu Uche pulled a goal back for Pune with the last kick of the game. Robin, scorer of Delhi’s opening goal, was away on national duty and missed the first two games for Delhi Dynamos. But no sooner he was available, Carlos chose to start with the India striker. Toni Doblas in goal for the injured Sanjiban Ghosh was the only other change for the visitors. Pune, however, are still looking for the perfect combination as was evident from the six changes that coach David Platt made for this crucial clash. Diego Colotto, Gouramangi Singh, James Bailey, Jackichand Singh, Wesley Verhoek and Kalu Uche all started the clash as Platt chose to rest players who had played the first two games. 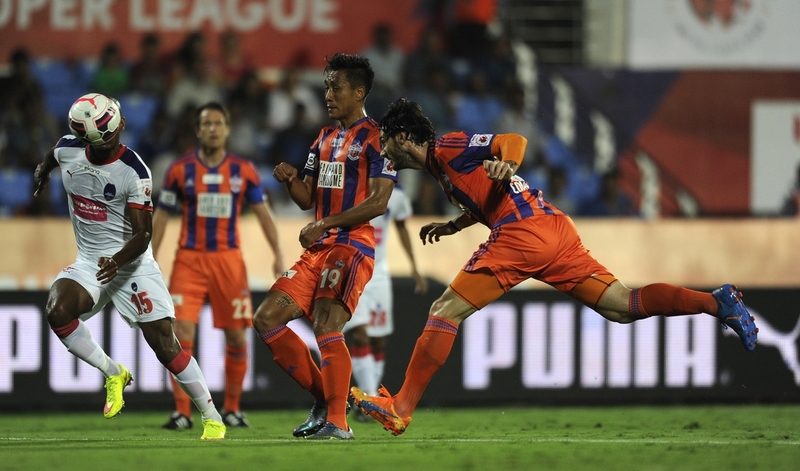 The six changes did not work for Pune as it were Delhi Dynamos who were calling the shots. Former Chelsea FC winger Florent Malouda was the star of the game and pulled strings from midfield. It was his control in the middle that gave Delhi the edge and it was he who set-up the opening goal. In the 23rd minute, Pune conceded a corner-kick, the first of the game. Malouda walked up to the corner to take the kick and smartly floated the ball into the middle where an unmarked Robin Singh did well to head the ball into the goal. It was Delhi’s first goal in three matches from open play and entirely deserving. Pune were stunned by the setback and tried to attack in numbers. Whatever Pune tried, Delhi were solid in defence, led by John Arne Riise, to avert the danger. Delhi were mighty aggrieved in the 45th minute when Gustavo dos Santos appeared to have been fouled inside the danger zone by Bailey but the referee ignored strong claims from the Brazilian midfielder. In the second session, Pune increased the pressure with Tuncay Sanli and Uche combining well. In the 48th minute, Uche released Sanli inside the box but his attempt was collected on second attempt by Delhi goalkeeper Doblas. Had someone been around to pounce on the rebound, Pune could have had the equalizer. 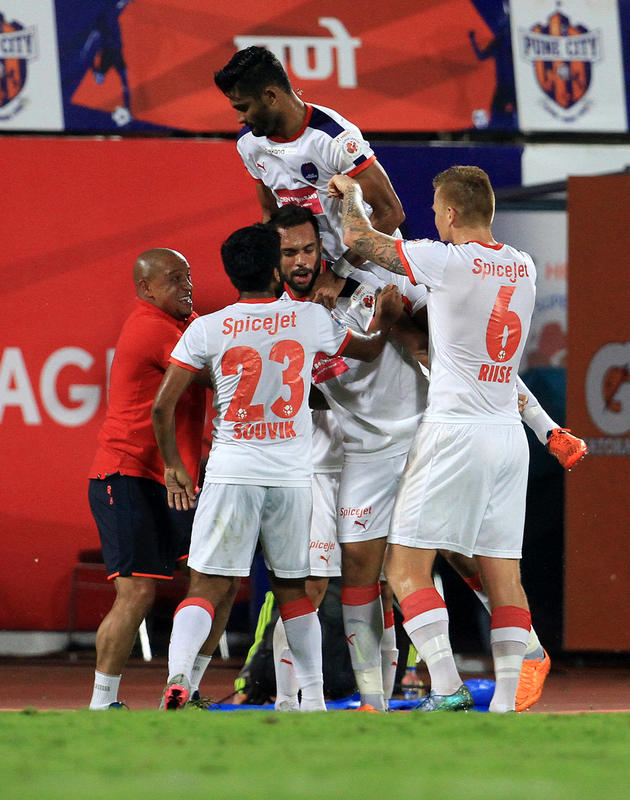 Ten minutes later, Uche went close as he headed Jackichand Singh’s free-kick but Doblas proved equal to the task. Delhi Dynamos scored their second goal in the sixth minute of added time when Brazilian midfielder Vinicius worked his way down the left flank and then essayed the ball for Gadze who finished with a simple tap. Pune, finally, got a goal they were hunting for all night as Eugeneson Lyngdoh’s shot was parried away by the Delhi goalkeeper with his feet only for Uche to head home the rebound. Pune would have been encouraged by the goal but there was no time left for a comeback. Diego Colotto of FC Pune City in action during match 11 of the Indian Super League (ISL) season 2 between FC Pune City and Delhi Dynamos FC held at the Shree Shiv Chhatrapati Sports Complex Stadium, Pune, India on the 14th October 2015. 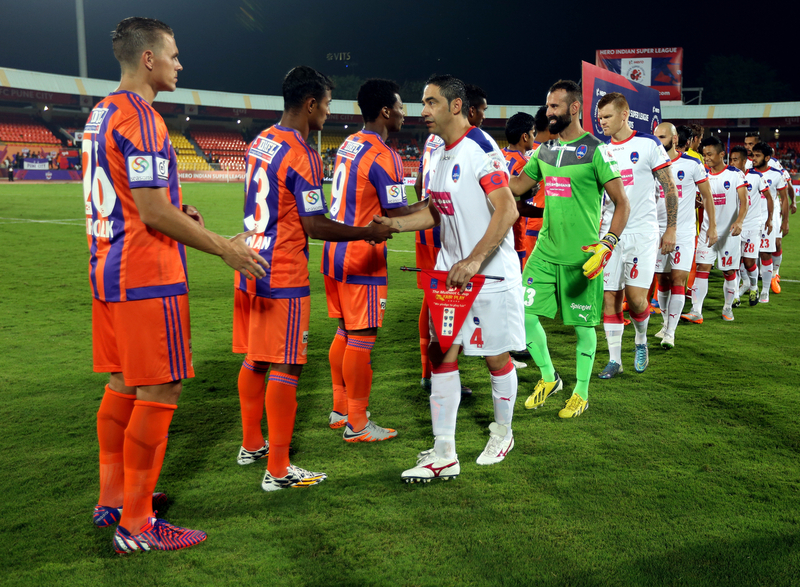 FC Pune City players and Delhi Dynamos FC players shakes hand before the start of the match 11 of the Indian Super League (ISL) season 2 between FC Pune City and Delhi Dynamos FC held at the Shree Shiv Chhatrapati Sports Complex Stadium, Pune, India on the 14th October 2015.